the email slipped in with no more than the ubiquitous ping. it came from my faraway brother, the one with a boy of his own now, a fine little lad rounding the bend toward two. in an instant, the snapshots came tumbling: my own firstborn’s second birthday, a summer’s day so hot and sticky he wore just a onesie as we tiptoed down the stairs to see what the birthday fairy had tucked in the living room corner. my heart nearly burst as i handed him the very first box i’d ever gone out and bought for him. it was a box so heavy the little guy couldn’t lift it. he needed his papa and me. inside: an oval of track, wooden track; one ivy-wrapped train station; and a little blue engine named thomas, thomas the tank engine, a train who’d ascend to a starring role in the celluloid loops of one boyhood. our sweet boy loved trains more than anything. for years, we rode them cross country, falling asleep to the sway of the bunks as we rolled through the heartland, the hudson river valley, or the rise of the rockies. we drove to where we could watch the lumbering locomotives, switching back and forth on the side tracks in the yard where they were hosed down and polished. we climbed aboard on sundays and rode up and down the “el” line, or around “the loop,” chicago’s train set for grownups. more than once, our little trainman plopped his head to the pillow and drifted to dreamland clutching one of his engines. he rarely left home without his striped engineer’s cap. and when he was four, and we drove to a farm to fetch a striped six-week-old kitten, our little trainman inserted “choo-choo” as the mewling’s middle name. one christmas, the very same brother who now wonders if we might send our train set his way stayed up the whole night, sawing and pounding vast planes and chunks of wood, a train table with sawdust-sprinkled landscape, one that stood on four stout legs, and rose to the precise height of one little boy’s waist, for maximum stretch of his train-steering arms. that blessed brother’s all-night labor made for a christmas awakening never to be exceeded. and then one day, the train table was collecting dust. the trains hadn’t moved one inch in the yard. they were tumbled all in a pile. and, in time, tossed in a bin and tucked at the back of the toy shelf. for years now, they’ve cowered in the dark. too treasured to be relegated to the attic. too forgotten to see the light of the murky playroom downstairs. but still that bin holds so many sparks of a boyhood, i can nearly hear its whispers. maybe more than anyone in the house, i’m the one still clutching the tracks and the sweet-faced engines. but around here we believe in hand-me-downs. and not only because it stretches a dollar. because a hand-me-down is history. is layers of story. of love. is animated even its stillness. and so, this morning, i will sift through the train bin. i will pluck out thomas, the blue one, and james, who is red. edward, i recall, is the kind engine (and thus, always, my favorite). and toby is a troublemaker. how could you not love the cast of your firstborn’s childhood? how could you not treasure the trains that, often, came to dinner? made lumps in the bed clothes? filled little-boy pockets? spouted faucets of tears if left behind, ever? that little train man is far from home now, 1000 miles away from the train table that is no longer. he’s all grown, and he told me just last week, with a thrill in his voice, that the window of his senior-year dorm room looks out on a train track that runs through the woods of his leafy new england college. and just a bit farther north and east, in the little town of south portland, maine, there is a little boy who doesn’t yet go to sleep dreaming of trains. but he will. oh, he will. as soon as i slap the shipping tape onto the cardboard box that waits in the basement. soon as the nice mailman scoops up the parcel and plops it onto a faraway stoop. soon as sweet milo crouches down in that way that boys do, and curls his fingers just so, round the spine of the train. and, full steam ahead, chugs through a childhood. bless the tracks and the trains, and the boys who so love them…. what are the treasures from your childhood? or the childhood of someone you love? do you recall bequeathing that treasure to the next keeper of treasure? It runs in the family.Do you remember the train town David built?It had hills and a river and lots of buildings.I have saved a few of those.Such fun and memories..
mama (name alert: that’s my MOM just above, also named barbara mahany; i know. SO confusing), david has ALWAYS been the amazing builder. i seem to recall lots of torn bits of newspaper and papier mache…and i built villages for my lady bugs. real ones. i even built my lady bug a church. and i’m sure i plopped her in it on sunday mornings. if she survived that long…. This brought back so many memories. Except that our train was a Lionel (Bill was 4 then) and the one who made the train table was his Grandpa who was wizard enough with carpentry that he made a folding table so that we could store it in our tiny, tiny basement. Hope Milo has years of fun ahead. oh, we had a lionel when i was growing up. and we gave it to sweet will to try once or twice. but nothing held the charms of the little wooden trains…. “Chicago’s train set for grownups.” Will love thinking about it that way from now on. Loved this story so much! What a wonderful story! I know Milo will love it as much as his older cousin did. And this is a terrific was to share and extend family history! how much do i love that, that ringing around the globe — all the way to south africa — there are train sets and little hands and big hearts being stretched and connected, one track at a time….. So charming, this wonderful story of childhood imaginings and dear old Thomas the Tank Engine. Oh, how I remember and treasure those days! Reading your words brought to mind an image of our son, James, who loved to play with his Playmobil castle, horses, and soldiers. He’d spend all day setting up complex scenarios with epic clashes between warring empires. His was a passionate world of chivalry, pageantry, heraldry, and glorious adventures which always resolved with goodness triumphant. Two of our son’s favorite knights still guard the top shelf of his desk…. they keep a steadfast vigil over the kingdom, where goodness and peace prevail. I can’t bear to part with these well-loved toys. Perhaps, someday, a grandchild will enjoy them. Great story. I so enjoy your writing. The story must be passed on with the trains. In our house the big trains are put away, but we still have a small one surrounding the miniature circus. It is for our grand kids. Oh, my, a floodgate of memories bursts open. Thomas and his friends were a source of peace for us. The very first starter set was to give a toddler quiet play after stitches in his noggin. Later, in a bleak, cleared sky September, they kept another toddler out of earshot of the relentless news that mom just couldn’t turn off. We had no faraway trips in the sleeper car, but we did hop the Metra to the “train park” in Wilmette, or to the green-barn McDonald’s in Lake Forest. Then, just as we noticed the wooden set was getting a little cobwebby for lack of play, the passel of preschoolers coming for Christmases had my boys setting up new, exotic rail systems, extending their childhood for a few more years. And the family lore that grew with Thomas…”I wanna buy an oboe” titles the story I’ll write someday about the passion for Thomas. Yeah, I didn’t get it either when I first heard that sentence from a 2-year-old. There’ll be no littles for a while now, but Thomas is waiting patiently in the roundhouse (and that’s a word I learned from Ringo). “roundhouse.” you just reminded me. we who can hear ringo in our heads. 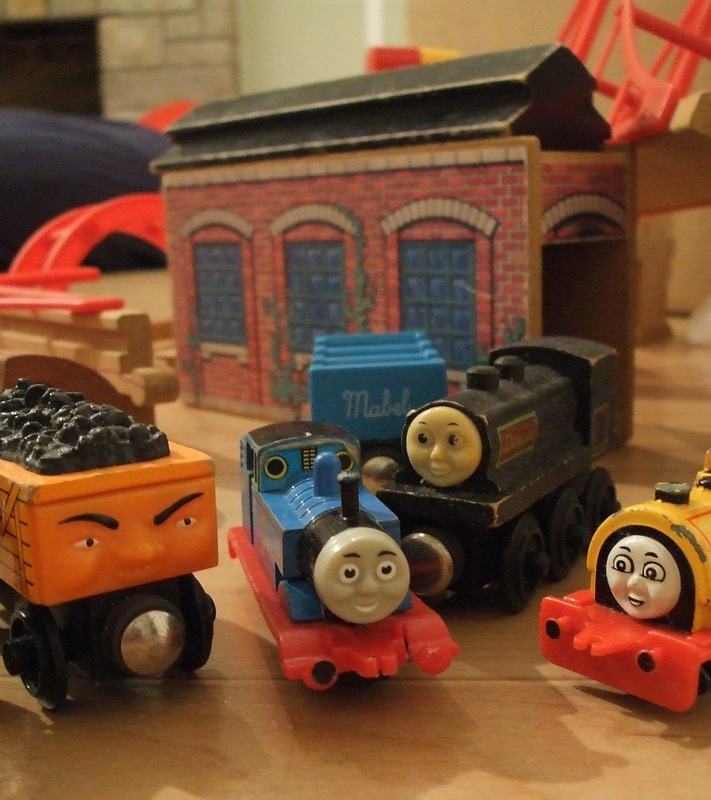 i love that thomas springs so many memories — sounds, pictures — back to life…..
so many well-loved thomases tucked into so many toy shelves, all over the globe….